When your kids are babies, you constantly hear about the benefits of reading aloud to them. From increased vocabulary to parent-child bonding, reading aloud is an important part of their early years. When my kids were young, we, like most parents, had a bedtime routine that consisted of brushing teeth, putting on pajamas, enjoying a few picture books together, and then about an hour of sitting on the floor in their room in the dark while they resisted falling asleep in their cribs. The picture book time allowed us to introduce some of our own childhood favorites to our kids. 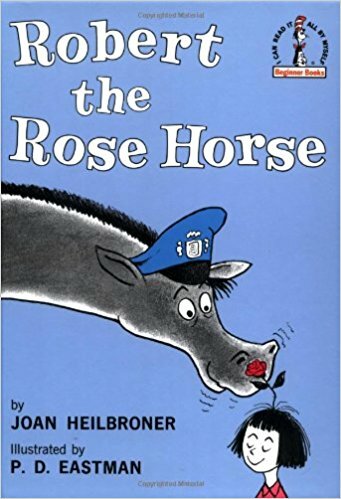 My husband loved acting out Robert the Rose Horse, by Joan Heilbroner, which his mother would read to him and his brother, especially as their eyes puffed up with allergies each spring. Robert, the horse, has allergies, so he must leave his farm to find work in the city. After his horrendous sneezes get him fired from multiple jobs, those same sneezes help him catch a robber. We always cheered when we got to the awards banquet scene. Last year, my daughter was allowed to bring in her favorite book to read aloud to her class for her class birthday celebration. Robert the Rose Horse was her immediate choice. At her conference later that month, the teacher commented on how engaging Becca was when she read the book aloud. "I've never seen all the kids so entranced with a read-aloud before. Every single kid enjoyed hearing her read it!" My childhood favorite was Fish Out of Water, by Helen Palmer, which my husband and I also enjoyed acting out. A young boy buys a tiny goldfish, and is warned not to feed him too much. Well, of course, he feeds him too much, causing the fish to grow and grow and grow! When the kids were in preschool and early elementary school, this was our go-to book for parent Mystery Reader days. If my husband was the Mystery Reader, he'd gather goldfish stuffed animals of various sizes (don't ask me why we have so many goldfish stuffed animals! ), and several cooking pots, and have the class act out the story as he read it. It was always a huge hit! As my son got old enough to read his own books, we continued with the nightly book-reading ritual. As an early reader, he was often frustrated by the basic stories of the leveled reading books he had to read himself. "I want a real mystery, not one of these who-stole-the-cookie-from-the-cookie-jar mysteries." So, our read-alouds went from picture books to chapter books. The escapades of Junie B. Jones, Cam Jansen, and Ramona Quimby danced in my kids' minds as they fell asleep each night. At the time, my kids shared a room, so they would listen as they were snuggled in their beds, while I read a few pages each night by flashlight in their dark room. I honestly never thought about how old the kids would be when they decided they no longer wanted us to read aloud to them each night. They now, at ages 9 and 11, each have their own room, but they still insist that we read. I sit in the hallway between their rooms, still with the lights off, and still with the flashlight on, but I now read a little louder since they both need to hear it in their separate rooms. Over the years, we have read through the entire Harry Potter series. We all cheered as Harry caught the snitch. We all cried when Dumbledore died. And after we completed each book, we'd reward ourselves by watching the corresponding movie. My son has enjoyed suggesting books he's read that he thinks his sister would like (and he wouldn't mind hearing again). On his own he's read the Rick Riordan Percy Jackson series, and wanted the rest of us to enjoy them, too. Since Greek gods are a big focus in fourth grade, he thought the summer before his sister entered fourth grade would be a good time to start. So far we've read the first two, and also the accompanying Percy Jackson's Greek Gods book. 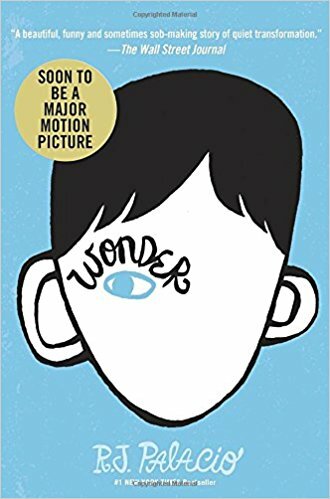 Last year, his fifth grade teacher read Wonder, by R. J Palacio, aloud to the class. A few weeks into the book, he knew it would be a great book for us to read at home. It is a story about a fifth grade boy with a facial deformity, who is entering school for the first time. While he's at first thought of as a freak, his kindness, compassion, and humor, soon brings the entire class closer together. (We are all looking forward to the motion picture coming out in November, though there is no way it can be as good as the book!) Since he had heard the book before, he loved asking us what we thought was going to happen. Sometimes, he'd stop me from reading and tell us to remember certain foreshadowing events. Other times we'd stop the books and just chat about how the characters were acting, and what they would do if they were in a similar situation. 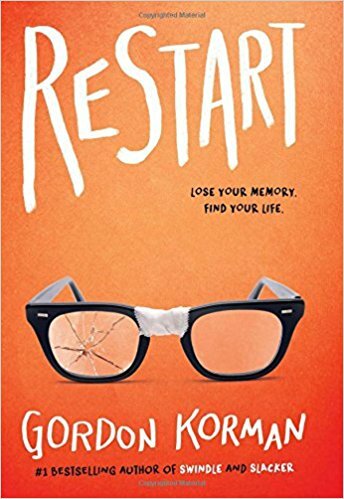 Our current book, Restart, by Gordon Korman, has a similar feel to Wonder. This story follows a middle school bully who gets amnesia. The boy learns about his old self from interactions with friends and classmates, and also reinvents himself. All the books we have read together over the years have led to some incredible family discussions, both at bedtime and other times. On nights when one kid is out or has fallen asleep early, the rule they have created is we don't read ahead. Instead, they usually pick a quirky book, like The Kid Who Invented the Popsicle. Each page of this book has a write-up about how a common item or product--Monopoly, Barbie Dolls, bingo, zippers, Band-aids--was invented. No matter how many times they have heard about it, they still want to hear it again. Though some nights, I wish our bedtime routine consisted of the kids reading to themselves to fall asleep, most nights I find joy in sharing this special ritual with them. We've had heartfelt discussions, learned life lessons, and shared the joy of reading, all with just a book and a flashlight.